St. Martin's Griffin, 9781250048165, 336pp. Outside Dunhammond Conservatory, there lies a dark forest. And in the forest, they say, lives a great beast called the Felix. But Sing da Navelli never put much faith in the rumors and myths surrounding the school; music flows in her blood, and she is there to sing for real. This prestigious academy will finally give her the chance to prove her worth—not as the daughter of world-renowned musicians—but as an artist and leading lady in her own right. Yet despite her best efforts, there seems to be something missing from her voice. Her doubts about her own talent are underscored by the fact that she is cast as the understudy in the school's production of her favorite opera, Angelique. Angelique was written at Dunhammond, and the legend says that the composer was inspired by forest surrounding the school, a place steeped in history, magic, and danger. But was it all a figment of his imagination, or are the fantastic figures in the opera more than imaginary? Sing must work with the mysterious Apprentice Nathan Daysmoor as her vocal coach, who is both her harshest critic and staunchest advocate. But Nathan has secrets of his own, secrets that are entwined with the myths and legends surrounding Dunhammond, and the great creature they say lives there. Lyrical, gothic, and magical, Strange Sweet Song by Adi Rule will captivate and enchant readers. ADI RULE grew up among cats, ducks, and writers. She studied music as an undergrad, and has an MFA from the Vermont College of Fine Arts. Adi is a member of, and has been a soloist for, the Tanglewood Festival Chorus, the chorus of the Boston Symphony Orchestra/Boston Pops. She lives in New Hampshire. 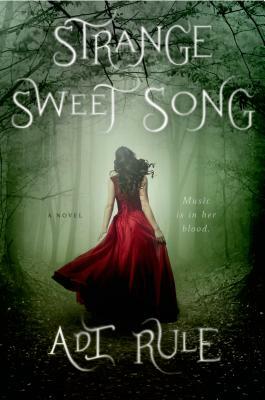 Strange Sweet Song is her first novel.